Citation: Courage UU, Tolulope AO (2017) Prevalence and Pattern of Soft-Tissue Rheumatism in a Semi-Urban Nigerian Population. 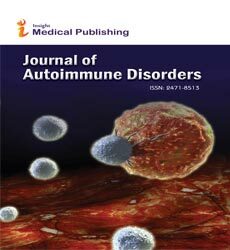 J Autoimmune Disord Vol 3:39. Copyright: © 2017 Courage UU, et al. This is an open-access article distributed under the terms of the Creative Commons Attribution License, which permits unrestricted use, distribution, and reproduction in any medium, provided the original author and source are credited. Soft tissue rheumatism (STR) forms a group of musculoskeletal disorders affecting the structures around the joint, including ligaments, tendons, tendon sheaths, bursa or muscles. They are characterized by pain and disability. Soft tissue pains are either localized or generalized. Generalized chronic pain syndrome is the hallmark of fibromyalgia, which has been the subject of many studies in other populations. There are very few community based studies on the epidemiology of musculoskeletal diseases in Sub-Saharan Africa , however, as data is beginning to emerge mainly from clinical practice, there is a bend towards reporting on the autoimmune inflammatory disorders [2-4]. But the scant available data from Africa and the increasing reports from COPCORD studies across the developing world indicate that the musculoskeletal problems in the community are predominantly osteoarthritis and soft tissue rheumatism [5-13]. Epidemiological data on STR are sparse in sub-Saharan Africa. Even in other developing populations where surveys of musculoskeletal diseases have been carried out, STR is often reported as a group in the spectra of musculoskeletal disease, with very limited attempt at describing the epidemiology of this group as an entity with its varying components [9,10]. Understanding the epidemiology of these diseases will go a long way both in educating the population as well as raising awareness among primary care physicians who are likely to be seeing more of these patients, to raise their index of suspicion and increase the diagnosis and proper management of these patients. Data from health care records are unrepresentative of the spectrum of disease in the community, as hospitals and clinics are more likely to see the more complex and severe cases, leaving a large proportion of the population who will not attend a professional health center unaccounted for . To get reliable data on such conditions, there is need for representative sample of the population to be surveyed . In this study, we describe the epidemiology of soft tissue rheumatism in a Nigerian community, by undertaking a sub-group analysis of a total population survey of musculoskeletal diseases carried out in a semi-urban Nigerian community in 2016, using the COPCORD methodology. The methods and results of the survey have been described in a previous publication . This is a sub-group analysis of 811 subjects reporting positive musculoskeletal symptoms in a cross sectional total population survey of 2454 adults, 15 years or older, residing in Katon Rikkos community of Jos, north central Nigeria, using the COPCORD methodology. Katon Rikkos is a semi-urban community located about 3.8 km from the Jos University Teaching Hospital (JUTH). The city of Jos is the administrative capital of Jos North LGA and Plateau state (north central Nigeria). The 2006 national population survey estimates the population of Plateau state to be about 3.5 million people and the population of people 15 years and above living in Katon Rikkos is estimated to be about 3000 . The ethical committee of JUTH and the community head of Katon Rikkos approved the study. Informed consent was obtained from every participant by signing or thumb printing on the consent form attached to the questionnaire. Trained health workers went from house-house to administer the COPCORD questionnaire. Subjects reporting positive musculoskeletal symptoms were examined and investigated at the rheumatology unit of the teaching hospital, by a rheumatologist to determine the specific type of musculoskeletal diseases within 4 weeks of the survey . In this study we performed a sub-group analysis of the 811 subjects who reported positive musculoskeletal symptoms, in order to describe the spectrum of soft tissue rheumatic disorders, factors associated with STR, as well as the impact of STR on the quality of life of the subjects, by assessing the degree of the disability associated with STR in this population, using the health assessment questionnaire disability index (HAQ-DI) score. Soft tissue rheumatism was assessed as any disorder affecting periarticular structures including muscles, tendons, ligament and capsules. Specific disorders of the upper limb were diagnosed based on the Southampton examination schedule ; fibromyalgia was diagnosed using the American College of Rheumatology (ACR) 1990 criteria . Subjects who had chronic widespread pain but did not fulfill the ACR criteria were characterized as Non-Specific Diffuse Pain (NSDP). Achilles tendinopathy was diagnosed using the royal London hospital test , plantar fasciitis was diagnosed using the American physical therapy association guideline . Patellar tendinopathy was diagnosed based on history of pain localized to the lower patellar pole or insertion of the quadriceps tendon with distinct palpation tenderness corresponding to the painful area . Data was analyzed using SPSS for Windows, Version 16.0. Chicago, SPSS Inc.
Chi-squared test was used to establish association between characteristics of the subjects and STR while logistic regression, adjusted odds ratio and 95% confidence interval were used to determine the predictors of soft tissue rheumatism, with p value of ≤ 0.05 considered statically significant. The degree of disability associated with soft tissue rheumatism was calculated from the Health Assessment Questionnaire Disability Index (HAQ-DI), with a score of ≥ 1, considered as significant disability (ranging from moderately severe to very severe disability) . A total of 811 subjects with musculoskeletal diseases were analyzed, 461 (57%) females and 350 (43%) males, with a mean (SD) age of 41.8 (15.9). The prevalence of STR was 138 (17.0%), with a female preponderance 92 (66.7%) vs. 46 (33.3%) males (χ2=6.5, P=0.018). The mean age (SD) of subjects with STR was 36.6 (12.5) years vs. 42.9 (16.3) years for those without STR. The highest prevalence was found in the 25-34 years age group, 55 (26.8%), with a progressive decline up to the age of 64 years (χ2=30.3, P<0.0001). The prevalence of STR increased progressively with literacy level, from 15.1% in subjects who could not read nor write, to 16.9% in those who could only read and 17.4% in those who could both read and write (χ2=0.4, P=0.53), while educational attainment had no statically significant relationship with the prevalence of STR (χ2=5.2, P=0.14). A history of smoking was associated with a lower prevalence of STR, 3.5% compared to 18.0% in subjects who have never smoked (χ2=7.9, P=0.005). A similar pattern was also found in subjects with a history of alcohol consumption, 10.0% compared to those who never drank alcohol, 18.5% (χ2=4.7, P=0.008). Occupation was also significantly associated with the prevalence of STR (χ2=8.2, P=0.02). The highest prevalence was seen amongst the unemployed (20.8%), while the lowest prevalence were in those who have retired from active work (7.4%). the history of hypertension, diabetes, trauma and a family history of musculoskeletal diseases, had no statistically significant association with the prevalence of STR Table 1. Table 1: Characteristics of subjects and the prevalence of STR. Logistic regression was used to determine factors that were independent predictors of STR. Five variables with P values <0.05 were imputed into the model because of their clinical and statistical association with STR, only age appeared to independently predict the occurrence of STR in the population Table 2. Table 2: Predictors of STR. 10 (7.2%) of the 138 subjects with STR had stopped working, 5 (50%) of them stopped because of STR (χ2=7.6, P=0.03), while only 1 subject with STR had a history of changing jobs due to STR. Self reported depression was found in 26 (18.8%) subjects with STR (or 0.64, 95% CI 0.40-1.01, χ2=3.7, P=0.05) and 22 (84.6%) of them attributed their depression to STR, while 54 (39.1%) subjects with STR, reported sleep disturbance as a result of STR (or 0.92, 95% CI 0.63-1.33, χ2=0.21, P=0.65). The mean (SD) HAQ-DI recorded in subjects with STR was 0.5 (0.4), while 13 (9.4%) had a significant disability index of HAQ-DI ≥ 1. The most common forms of STR diagnosed was non-specific diffuse pain, 39 (28.3%; 95% CI=21.4-36.3%), paraspinal muscle spasm, 31(22.5%; 95% CI=16.3–30.1%), plantar fasciitis, 24 (17.4%; 95% CI=12.0–24.6%), rotator-cuff tendonitis, 15 (10.9%; 95% CI=6.7–17.2%) and fibromyalgia, 12 (8.7%; 95% CI=5.0– 14.9%) Table 3. Table 3: Spectrum of Soft tissue rheumatism. Paraspinal muscle spasm was the commonest by age, 20 (67.7%) in the 15-24 years age-groups, (χ2=1460.5, P=0.2), while NSDP was the commonest STR in both males and females, 16 (33.3%) vs. 23 (22.2%) (χ2=11.7, P=0.9). Depression was more common in those with PSM, 7 (30.4%, χ2=5.6, P=0.2) while sleep disturbance was more common in those with NSDP, 16 (30.2%, χ2=12.0, P=0.9), the highest level of disability; HAQ-DI 1.9, was also recorded in subjects with NSDP. 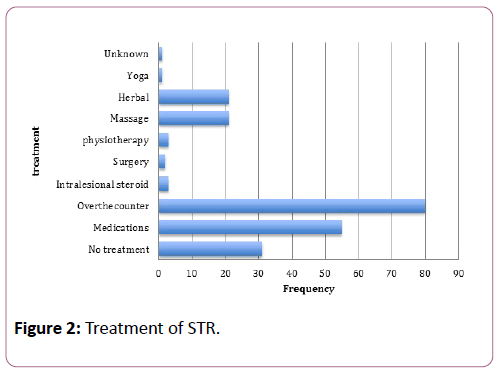 Most subjects with STR, 40 (29.0%) attributed their symptoms to occupation related problems. Other attributed causes include cold weather, 37 (26.8%) and trauma 12 (8.7%), while 27 (19.6%) had no idea what was causing their symptoms Figure 1. 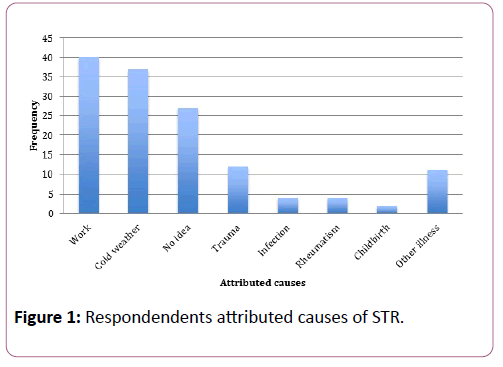 Figure 1: Respondendents attributed causes of STR. Over the counter medication, 80 (58.0%) were the most common source of treatment for STR vs. 55 (40.0%) who used hospital prescribed medications Figure 2. Figure 2: Treatment of STR. This is the first study to delineate the epidemiology of soft tissue rheumatism in a Nigerian community. The data is from a subgroup analysis of an earlier published COPCORD type survey . The prevalence of soft tissue rheumatism in this population was high, similar to other COPCORD studies [6-13], indicating that soft tissue rheumatism is one of the major contributors to the burden of rheumatic diseases in the community. As in most rheumatic diseases, females were significantly more affected than males, but the only independent predictor of STR in this population, was the age range 35-44 years, which represent a very productive age group in any community. This may explain why occupation was significantly associated with the prevalence of STR in this population, even though the highest prevalence was seen among the unemployed, consistent with previous findings that both physical and psychosocial factors related to work, play significant roles in the epidemiology of STR [14,23]. The relationship between smoking and musculoskeletal pain has at best been described as inconsistent [24,25], even though none of these studies was specifically done in subjects STR. However, in this study we found significantly lower prevalence of STR in smokers, more studies are needed to clarify this finding. Alcohol consumption was also significantly associated with a lower prevalence of STR, in keeping with other reports of musculoskeletal pain [26,27] but no reports specific to STR. Majority of subjects in this study that met the criteria for wide spread pain did not meet the 1990 ACR criteria for fibromyalgia, however, the fact that many of them reported sleep disturbances, depression and significant disability, makes it possible that many of them could have been classified as fibromyalgia if the 2011 criteria was applied. The 2011 revision of the ACR criteria for fibromyalgia is thought to be a more survey and epidemiological studies friendly criteria; however, the criteria still require further studies for acceptance, reliability and validity [28,29]. The predominance of paraspinal muscle spasm in the 15-24 years age group may indicate that this is the final common pathway for low back pain in young adults with different etiological factors, more studies will be required to clarify this. It is generally accepted that most soft tissue rheumatic diseases results from micro trauma due to repetitive and over use injury , this may be the reason why majority of subjects in this study attributed their symptoms to work, however, a significant proportion of the population have no idea what could be the cause of their symptoms, making the need for musculoskeletal health education in the community, a priority. More than half the population use over the counter treatment for STR, this may be because of lack of awareness of the potential disability that can result from STR, since some of the conditions present with mild persistent pain that may progress to significant functional impairment as shown by the high prevalence of significant disability in this population. This begs the need for prompt recognition and treatment; however, prompt recognition will require the ability to differentiate articular from non-articular pain when a patient presents with ‘joint pains’. This may be an uncommon skill for the non-rheumatologist in a population where rheumatic diseases are not included in the curriculum for undergraduate medical training. In the Western world where most of these conditions have been well reported, it is still considered one of the most misunderstood categories of diseases facing the primary care physician . There are no available data in Sub-Saharan Africa to bring these conditions to the awareness of neither the primary care physician nor the community health worker. To overcome this challenge, the few available rheumatologists in the country, must take up the responsibility of training both the community health worker and the primary care physician to make this differentiation and increase the diagnosis and treatment of soft tissue rheumatism. Limitations to this study include the secondary nature of the data analysis, therefore, modifications could not be made to data collection process, for instance, the 2011 criteria for diagnosis of fibromyalgia may have been more appropriate to increase the diagnosis of fibromyalgia from the pool of NSDP. Data was obtained from a cross-sectional study funded by the International League of Associations for Rheumatology (ILAR) funded project 2015 and the Medical Education Partnership Initiative in Nigeria (MEPIN) project funded by Fogarty International Center, the Office of AIDS Research, and the National Human Genome Research Institute of the National Institute of Health, the Health Resources and Services Administration (HRSA), and the Office of the U.S. Global AIDS Coordinator under Award Number R24TW008878. Chopra A, Abdel-Nasser A (2008) Epidemiology of rheumatic musculoskeletal disorders in the developing world. Best Pract Res Clin Rheumatol 22: 583–604. Mody GM (2017) Rheumatology in Africa—challenges and opportunities. Arthritis Research & Therapy 19: 49. Adebajo A, Davies P (1994) Rheumatic diseases in African blacks. SeminArth Rheum 24: 139–153. Adelowo OO, Bello MKN (2014) Systemic autoimmune diseases: not so rare in black Africans. Rheumatology (Sunnyvale) 4: 130. Uhunmwangho CU, Dungwom PS, Imoh CL, Ani C, Agbaji OO, et al. (2017) Prevalence of musculoskeletal diseases in a semi-urban Nigerian community: results of a cross-sectional survey using COPCORD methodology. ClinRheumatol 1-8. Minaur N, Sawyers S, Parker J, Darmawan J (2004) Rheumatic disease in an Australian Aboriginal community in North Queensland. Australia A WHO-ILAR COPCORD survey. J Rheumatol 31: 965–972. Haq SA, Darmawan J, Islam MN, Uddin MZ, Das BB, et al. (2005) Prevalence of rheumatic diseases and associated out- comes in rural and urban communities in Bangladesh: a COPCORD study. J Rheumatol 32: 348–353. Chopra A (2003) The COPCORD world of musculoskeletal pain and arthritis. J Rheumatol 52: 1925–1928. Fereydoun D, Ahmad-Reza J, Arash TB, Jaleh GM, Mohammad HF, et al. (2008) WHO-ILAR COPCORD study (stage1, urban study ) in Iran. J Rheumatol 35: 1384 –1390. Dans LF, Tankeh-Torres S, Amante CM, Penserga EG (1997) The prevalence of rheumatic diseases in a Filipino urban population: a WHO-ILAR COPCORD study. J Rheumatol 24: 1814–1819. Chaiamnuay P, Darmawan J, Muirden KD, Assawatanabodee P (1998) Epidemiology of rheumatic disease in rural Thailand: a WHO-ILAR COPCORD study. J Rheumatol 25: 1382-1387. Llerena GAR, Toledani MG, Martinez AAH, Otero ZAG, Varela JA, et al. (2000) Prevalence of musculoskeletal complaints and disability in Cuba. A community based study using the COPCORD core questionnaire. Clin Exp Rheumatol 18: 739–742. Minh Hoa TT, Darmawan J, Chen SL, Van Hung N, ThiNhi C, et al. (2003) Prevalence of the rheumatic diseases in urban Vietnam: a WHO-ILAR COPCORD study. Rheumatol 30: 2252–2256. Natvig B, Picavet HSJ (2002) The epidemiology of soft tissue rheumatism. Best Pract Res ClinRheumatol 16: 777-793. Adebajo A, Gabriel SE (2010) Addressing musculoskeletal health inequity in Africa. Arth Care and Res 62: 439–441. Keith P, Karen WB, Cathy L (2000) The Southampton examination schedule for the diagnosis of musculoskeletal disorders of the upper limb. Ann Rheum Dis 59: 5–11. Wolfe F, Smythe HA, Yunus MS (1990) The American College of Rheumatology 1990 criteria for the classification of fibromyalgia. Report of the Multicenter Criteria Committee. Arthritis Rheum 33: 100–172. Longo UG, Ronga M, Maffulli N (2009) Achilles tendinopathy. Sports Med Arthrosc 20: 112-126. Robroy LM, Todd ED, Stephen FR, Thomas GM, James WM, et al. (2014) Heel Pain- Plantar Fasciitis: Revision 2014. Clinical practice guidelines linked to the international classification of functioning disability and health from the orthopedic section of the American physical therapy association. J orthop Sports Physther 44: A1-A23. Blazina ME, Kerlan RK, Jobe FW, Carter VS, Carlson GJ (1973) Jumper’s knee. Orthop Clin North Am 4: 665-673. Bonnie B, Fries JF (2003) The Stanford Health Assessment Questionnaire: dimensions and practical applications. Health Qual Life Outcomes 1:20. Bair MJ, Wu J, Damush MT, Sutherland JM, Kroenke K (2008) Association of depression and anxiety alone and in combination chronic musculoskeletal pain in primary care patients. Psychosom Med 70: 890–897. Leoboeuf-Yde C, Yashin A, Lauritzen T (1996) Does smoking cause low back pain? Results from a population based study. Journal of Manipulative and Physiological Therapeutics 19: 99-108. Palmer KT, Syddall H, Cooper C, Coggon D (2003) Smoking and musculoskeletal disorders: findings from a British national survey. Ann Rheum Dis 62: 33-36. Bingefors K, Isacson D (2004) Epidemiology, co-morbidity, and impact on health-related quality life of self-reported headache and musculoskeletal pain – a gender perspective. European journal of Pain 8: 435–450. Bergman S, Herrstrom P, Hogstrom K, Petersson IF, Svensson B, et al. (2001) Chronic musculoskeletal pain, prevalence rates and sociodemographic associations in a Swedish population study. J Rheumatol 28: 1369–1377. Wolfe F, Clauw DJ, Fitzcharles MA, Goldenberg DL, Hauser W, et al. (2011) Fibromyalgia criteria and severity scales for clinical and epidemiological studies: a modification of the ACR Preliminary Diagnostic Criteria for Fibromyalgia. J Rheumatol 38: 1113–1122. Biundo JJ (2008) Regional Rheumatic Pain Syndrome. In: Primer of Rheumatic Diseases, thirteenth edition. Ed: Klippel HJ, Stone HJ, Crofford LJ, White HP. New York. Springer Science+Business Media. Reveille JD (1997) Soft-tissue rheumatism: diagnosis and treatment. Am J Med 102: 23S-29S.